From common shipping labels to manufactured labels for specialty applications, Spectrum can take care of all your custom label needs. 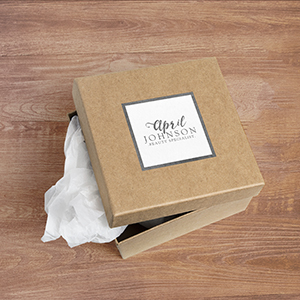 Whether you're looking for point-of-purchase materials, bottle neckers, wine labels, window clings, parking permits, or even four-sided box labels for packaging/specialty boxes, we will work with you to design custom labels and help you implement them in effective ways. Metallic ink can add that extra pop to your personalized labels and UV coating will ensure that they’re protected with a premium gloss. When we design a label, environmental factors such as cold or moisture need to be considered. We have many substrates and inks available to help increase the durability of your finished product, alleviating the need for printing labels frequently. Make sure all your retail and restaurant items put their best foot forward with a polished, professional label and protective coating.